X-ray spectroscopy has become a commonly used tool to probe to structure of transition metal complexes, allowing for element-specific measurements. Conventional X-ray absorption spectroscopy (XAS) masurement transmission like UV-Vis, however this methodology is subject to very strong spectral-peak broadening due to the short lifetime of the core hole. High-energy resolution fluorescence detection XAS (HERFD-XAS) offers an alternative method of measurement, reducing lifetime broadening and thereby showing more detail in the spectra. 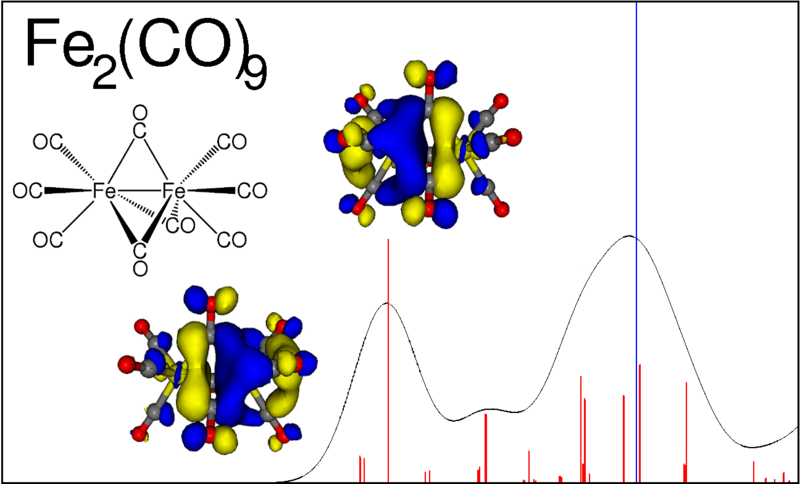 In a recent study on iron carbonyl complexes, containing both polyiron and substituted complexes, HERFD-XAS spectra were measured and rationalized by TDDFT calculations in ADF. These complexes were chosen as they are considered well characterized and are a textbook example of transition metal complexes. It was shown that pre-edge peaks, assigned by TDDFT calculations, can be used to distinguish between different transition metal complexes, in particular the different iron-iron interactions. The combination of different XAS methods offers a unique way to probe both the ligand environment and the electronic structure of iron carbonyls in situ during catalytic processes. Calculated X-ray absorption spectrum for Fe2(CO)9 (absorption peaks in red, ionization blue, Gaussian-broadened spectrum in black). The two pre-edge peaks on the left are observed in the HERFD-XAS spectrum. Also shown are the two unoccupied orbitals invovled in these pre-edges (1s→3d).